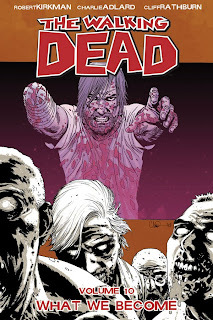 Checked my emails this afternoon and was seriously happy to find out that I am the lucky winner of a signed copy of 'The Walking Dead' from Venntertainment. Rob Cumiskey, the man behind Ventertainment and a regular at Culch.ie, did a ‘Fantasy Bazaar – The Walking Dead Week’ last week to celebrate the release of the latest volume of The Walking Dead, by Robert Kirkman and Charlie Adlard. As part of his zombie week, Rob was given a signed copy of the release by Sub City Comics (@SubCityComics). A massive thanks to Rob for the great week of posts, and the brilliant competition. Cheers dude! Not at all - great posts always!